Find out how dental implants are able to replace missing teeth for life. Are you missing one or more teeth? Are you looking for a restoration that will not just look like the rest of your teeth but also function similarly? If you said “yes” then it’s time to talk to our Matthews, NC, dentist Dr. David Feeney about how dental implants could improve the health and appearance of your smile. 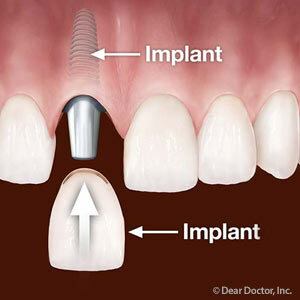 An implant is a very small metal restoration that is placed into the jawbone below the gum line. While the implant isn’t visible when you smile, it will provide a long-term and stable foundation from which to support a false tooth. Implants can be a lifelong restoration because they actually fuse together naturally with the bone and tissue in a process known as osseointegration. Once osseointegration is complete, the implant will now function in the same way as natural tooth roots. Getting implants requires multiple steps and several months. The length of your treatment will depend on factors such as your health, how quickly the implant bonds with the jawbone and how many implants you are getting. After all, several implants can be placed along the jawbone to support a complete set of dentures (this process will take longer than for those patients only receiving a single dental implant). If you are an adult dealing with tooth loss then chances are you could benefit from getting dental implants in Matthews, NC. Of course, our restorative dentist will need to perform a thorough examination complete with x-rays to make sure that your jawbone and the rest of your mouth is healthy enough to support an implant. Do you have questions about getting dental implants in Matthews, NC? Do you want to find out if you are an ideal candidate for this restoration? If so, then call our dental office today to schedule your consultation with Dr. Feeney. Missing even one tooth can make chewing difficult, smiling uncomfortable, and even puts the rest of your teeth at risk for shifting out of place! However, Dr. David Feeney, your dentist in Matthews, North Carolina, can make that discomfort a thing of the past with dental implants. 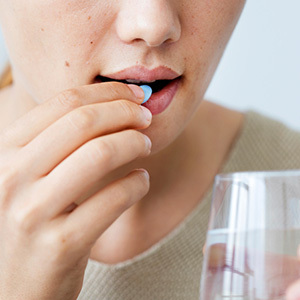 These amazing tooth restorations are permanent, attractive, and easy to care for. Wondering if dental implants are right for you? Read on! Dental implants are designed to replace any permanent teeth that have extracted, knocked out, or otherwise lost. Some implants only have one porcelain tooth attached to them; others can have several teeth, like a partial denture, that fill in the gap for a whole section of your smile. There's even the option of having implant-supported dentures! With an examination, your Matthews dentist will be able to determine your needs. Do You Want a Low Maintenance Option? One of the best aspects of dental implants is that they never need to be removed for cleaning or adjustments and don't require any special maintenance. Simply brushing, flossing, and making time to see your Matthews dentist twice a year is all that your dental implants will need to stay in place for decades, even a lifetime! Do You Have Healthy Bone Structure? 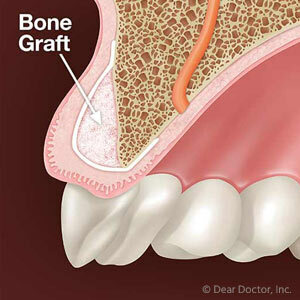 Most patients experiencing tooth loss make great candidates for dental implants. However, there can be a few conditions that may require a different restoration. One of the main reasons that dental implants may not work is because the density and quality of the jawbone can deteriorate at a surprising rate after teeth are lost, and the post of the implant needs a solid foundation to stay stable. This isn't the case for everyone; it depends on a number of factors, including your health, your genetics, and how long you've been missing your teeth. Of course, Dr. Feeney can check your jawbone's structure by taking a quick X-ray in the area where you're missing teeth and fully determine if implants are a good option for you. To get started, contact the dental office of Dr. David Feeney in Matthews, North Carolina and ask our friendly staff to schedule you for a dental implant consultation. We look forward to helping you smile more confidently!